After 5 months finally I made a new wallpaper! Creating this wallpaper didn’t take much time, ‘cause as you see all main work and effort I put into vector, and as it covers all of wallpapers space I made simple bg. I hope you like it and thanks for any support, I really appreciate it! Wow, amazing!~ What a neat vectoring and colouring, awesome work! ..I think I fell in love! I don't even know where to look *_________*! Amazing work! You did a really good wallpaper! Really amazing attention to detail work on your vector and love the flames. Great job on this! Love it alot! Yes yes! We need more smexy walls like this! *quickly downloads* LOVE YOU! Love the way you blend the colours and shadows and lights. It gives it a mixture of rich colours with a soft-ish feeling. this is definitely a treat in all aspects, character and colour wise! No he visto Hitman, pero que buena la imagen! 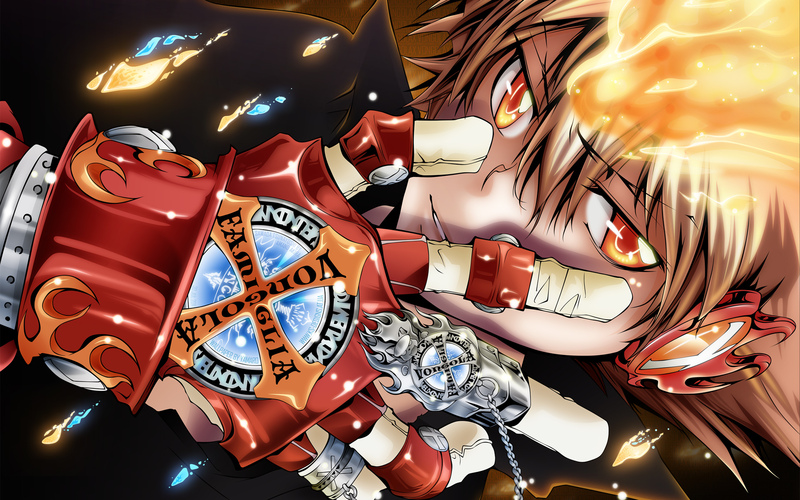 I'm not into KHR, but the vector is SO STUNNING and just vivid!That flames are just gorgeous! I think the colors (the red particularly) could be a bit richer to create more of a contrast? Other than that, I love it. The flames, especially. THE FLAMES. SHINY.